On March 16 Jan Adler and I shared some experiences of grief. I told the story of my son Joshua, his tragic death, and mostly I focused on the ways I experienced grief in the years that followed his death. Joshua’s father called me from Portland to tell me our son Josh had died by suicide. Suicide attempts were not uncommon for Josh, as he had multiple mental diagnoses. His first attempt was when he was in 5th grade, and throughout his 26 years attempts were frequent. He would call me or another friend to be rescued after overdoses. One week before his death, he was hospitalized for an attempt with pills. He left the hospital against Dr.’s orders, disappeared for a few days, came back to his family, and then he told his brother by telephone he was going to hitch-hike to San Francisco to get away from things for a while. He left, and the next day the coroner was at his Dad’s door that cold, December morning. If you had met him, even for a brief time, you would remember his kindness, creativity, commitment to social justice, his limitless curiosity, loyalty to his friends and how much he loved his mum. He faced a life of almost continuous turmoil within himself and in his life. Early drug treatment was somewhat effective, and when he turned 18 he chose not to take medication very often. Despite his illness, he found some satisfaction in some of his jobs. He wrote stories and poetry. We loved to watch birds, and we enjoyed the Portland Trailblazers as often as we could. He is missed, and if I could have taken his place so he could have lived, I would have done so without hesitation. Living past my son’s death became a place of isolation and pain unlike any other I had ever experienced. I couldn’t stand that the world was still rotating on its axis, that the sun would rise, that in mornings all over the world millions of people were opening their eyes. But not Josh. I wanted to crawl back to the past to where he last breathed so I could bring him along with me into the future. I searched for him from my most primitive and maternal subconscious, testing for his scent everywhere I went. I didn’t make up my mind to do this: it is how my body reacted to his death. I was pulled between living life alive and moving through life deeply shrouded. My experience of grief encompasses both my love for Josh and the pain of his death, side-by-side, sometimes consuming me, other times the pain lessened by the strength of a memory. The earliness and manner of his death was foreshadowed in his childhood. However this knowledge did nothing to lessen the impact of his death or the grief that followed. Thinking, reasoning, straight research did not help me. I read every book I could find on bereavement. Nothing resonated with me. My head did not find the new way. I decided to start doing something physical. In February several months after Joshua’s death, I came alone to our newly purchased-unimproved lot on Galiano where we had parked a small trailer. Mission: pull broom until collapse. Then at night write in a journal until sleep forces itself upon me. Repeat. Repeat. Repeat. I cleared broom. The piles were taller than me, the broom itself often of tree-status. I found undiscovered trees, mainly arbutus that were being out-competed by the broom. Already Spring was near, and certain bushes were beginning to leaf out. Each day I cleared, I could see the success—broom removed and a more natural habitat revealed. Each day I could see slightly incremental increases in the greening for spring. I cleared in the rain, the wind, the cold. I had only one goal—to find physical exhaustion. In that state, I could write without inhibitions. The words came unbidden. The most essential, the most vulnerable parts of me surfaced and beheld the grief. Cautiously I explored this new geography of my life, usually a small step at a time. Not always forward progress, but side-to-side, backwards, to and fro. This experience was the first time I put the whole of me into the grief that now is part of me. Since then, I have initiated survivor support groups in Vancouver to talk to others who have lost a loved one to suicide. I have thoroughly investigated the details of his death, examined erroneous processes and held those systems up to scrutiny. I have worked on ways to commemorate his life—like burning the 24-hour candle, the Jahrzeit candle, on his birthday and on the anniversary of his death. Some of his friends found me—some even through Google and Facebook— and shared great gifts—new stories of him. I have written journals that describe and document the pain and also the breakthroughs back to life. I have figured out what to do with his things through action. I learned to live (by living, by doing) on this new planet without him. I like to bird-watch with his eyes sometimes. I listen to music he loved with his brand of joy. As I go through my days, I often observe that Josh would have loved this or that. And, of course, I continue to pull broom. I was changed by his death and am transformed by the grief. The process will probably not end. Grief and I will continually and infinitely transform each other, keening in the pleasure and pain of memories, and discovering today and tomorrow, sometimes with tears, sometimes with joy, and, now, always with life. Nothing was simple or obvious. Most every step was risky—and I was scared. Yet with each step, I move with life. Sensitivity to the smallest of things—like the color of the sky, the leaf that falls, the human voice—are the things that guide my map to life and living. This is not the person I would have chosen to be—the mother of a dead son. Yet here I am, hardly alone in this situation. Each day the grief is transformed yet again, life is full, the sun comes up, and I see stars at night. Everything changed and continues to change. He would like it that way. On Sunday March 27, the Galiano Health Care Society held a tea at the South Hall in appreciation of the many volunteers who donate time and energy to offer the best possible health care on the island. We were entertained by Jenny Sterling and Dan Elmes as well as Diane Laronde. Thank you to all the volunteers and let it be known that we are all very grateful to you. Galiano’s Got Talent- It Sure Does! 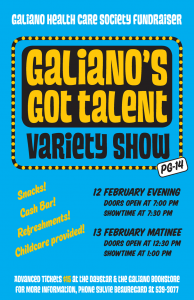 I hope you were one of the people in the two sold out shows on the 12th and 13th of February that witnessed the fantastic and often hilarious talent Galiano islanders offered to the community as a fundraiser for the Galiano Health Care Society and Centre. The diversity of acts was impressive. We were at Studio 54 with Ginga’s original electro-funk, a smoky jazz bar with Genny Laronde, stand-up at Yuk-Yuk’s with an autobiographical genius version of her new life as Trustee with Sandy Pottle, and getting a glimpse into the underbelly of Galiano’s social life with Speed Dating Galiano Style. These are just a few of the wonderful acts that came out to support health care on Galiano and gratitude is what we feel for their efforts to entertain and support us all. Diona Davies, Ian Maday, Dan Elmes, Kenna Fair, Judy Parrack, Allan Forget, Susan Mackey, Yvonne Coletta, Patti our wonderful bar-keep, Sheila Midgely, Bill Ripley, Sanda Dolph, Board Members of the GHCS, Daystar Market and staff, Mike and Jenny at the Garage, Jim, Lee and staff at Galiano Island Books, and of course all the performers. We raised a little over $3000 for health care, quite an achievement. Thanks to all who attended, and enjoy these photos of the show provided by Henny Schnare with much thanks. Galiano’s Got Talent Variety Show at the South Hall. Come and enjoy seeing residents of Galiano strut their struff for the benefit of the Galiano Island Health Society. There will be dance, comedy, music, skits and more.